Cedar Bird Box with Wireless Colour CCD Camera - 32mm Hole | The Best Spy Tech Store Online! 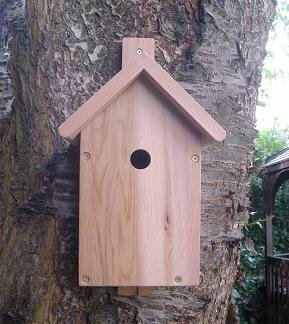 Hand crafted Cedar bird box with a Wireless High Resolution Low Light Sony 700TVL CCD Colour Camera, Infrared and Audio. Two 32mm panels on the sides to let in extra light. When the light level falls a photo cell turns on the infrared LEDs and the image turns progressively to black and white. In total darkness it will produce a clear black and white image. The infrared light is invisible to the naked eye, harmless to the birds and does not disrupt their natural day/night, light/dark cycles which artificial light can do. The picture and sound are sent wirelessly on the 2.4Ghz band to a receiver base. There is no need to run cables from the bird box to your TV. A receiver base plugs into your TV’s AV channels via the provided AV cable or Scart. The camera operates on the licence exempt 2.4Ghz frequency, which is CE compliant throughout the EU. The wireless system has an unobstructed transmission range of approximately 100m. Going through obstacles reduces the range, however as a general guide you should be able to transmit approximately 30m and through 1 or 2 normal house walls. PLEASE NOTE: Wireless refers to how the Video and Audio is transmitted i.e. no cable runs from the bird box to the TV. However the bird box requires power to run the camera, transmitter and infrared, it is powered through the supplied 12V DC power supply and 10m cable plugged into the nearest mains socket, e.g. shed, garage etc. (if 10m is insufficient then 10m extension cables are available). The wireless signal will be blocked by metailc objects, e.g. a metal clad wall. What is included? – Cedar bird box with installed Sony colour CCD camera with infrared, 2.4ghz transmitter and microphone – transmits both video and audio – 10m (32ft) 12V low voltage power cable (10m extension cables are available) – 2 x 12V regulated power adapter for the bird box and receiver base, 1m AV cable and a scart connector – setup and operating instructions. Available with 25mm, 28mm, 32mm and 38mm holes.